A mesh curtain. 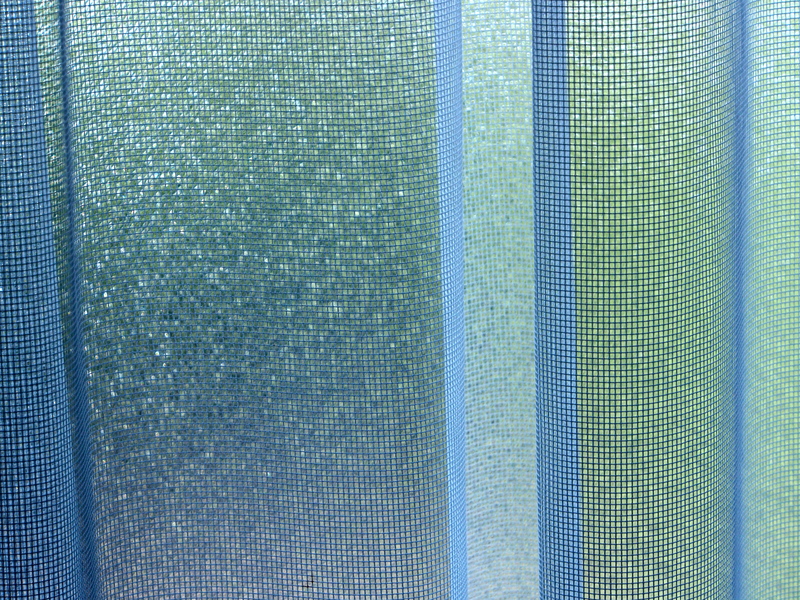 Textured glass. And, shades of green and blue, playing through the translucence of the window. An unexpected lay-over due to a cancelled flight produces unexpected beauty. Beauty in the every-day, the mundane. Beauty found in the detail. Maybe even beauty transcending the detail. All of it, unexpected Joy. I love the simplicity of this, Juli, and seeing it through your eyes. Wishing you a wonderful day ahead! Simple but definitely not mundane. There is a jewel-like quality to the mesh overtop the pebbled glass that is so appealing – I love the soft turquoise and green color scheme – so restful and hypnotizing. I like how your turned your unexpected layover into something wonderful and creative and imaginative. So very inspiring. This is a great series – I can’t wait to see what other unexpected surprises it brings. It looks like rain, but then I have rain on the brain lately…or rather, the lack of it. Lovely textures and soft colors. And bravo for finding creativity in an unexpected layover!